One-day captain Eoin Morgan says he has given up on playing Test cricket again but aims to lead England to the 2019 World Cup. The 30-year-old played the last of his 16 Tests in 2012, while he has appeared in 240 one-day and T20 internationals. England face West Indies in three ODIs next month, with the first game taking place in Antigua on 3 March. “Test cricket has gone for me. I don’t think I’ll ever play it again,” said Morgan. Joe Root, who plays in all three formats, was named as England Test captain earlier this month. However, Morgan said he “absolutely” wants to retain the captaincy of England’s white-ball sides before the Champions Trophy this summer and World Cup in 2019, with both tournaments taking place in England and Wales. “That’s where all the plans are going towards, what we’re working towards as a side so it will be great to be a part of it,” said Morgan. 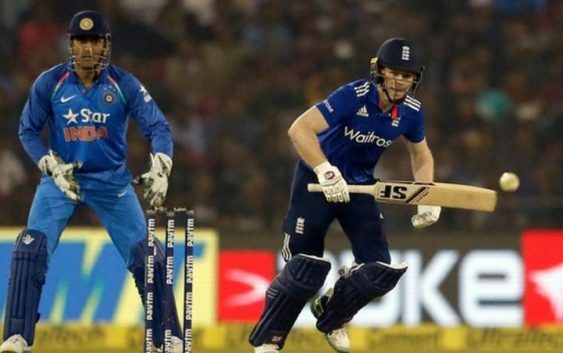 The left-handed batsman also confirmed he will fly back from the Indian Premier League to captain England in two ODIs against Ireland in May, after he was bought by Kings XI Punjab for £240,066 in last week’s IPL auction. He will then return to India for a potential two final IPL fixtures prior to England’s Champions Trophy training camp starting in Spain on 14 May. Meanwhile, opener Alex Hales could feature against West Indies, having been left out of the initial squad after suffering a hand fracture against India in January. The 28-year-old is due to have a scan on Monday and will potentially fly out to join the squad if given the all-clear. England take on a West Indies Cricket Board President’s XI in the first of two warm-up matches in St Kitts on Saturday, with the second game on Monday.